As a small office is considered to be any firm with less than 100 employees, we recommend SBK21 / SBK20 biometric device and Time & Attendance software (Desktop version) will help to simplify the attendance process and cost effective solution too. For companies with multiple locations, these issues are experienced tenfold. It becomes very difficult for HR personnel to keep track of attendance data of every employee, at every site. As a result, it may lead to erroneous payroll calculations and chaos. It may also lead to delay in salary payments. Hence, such companies require a solution that enables them to manage attendance and payroll data of each employee from a central location. Our SBIN01 / SBFACE401 and Web based Stone Bridge solutions provide a perfect answer to these issues. 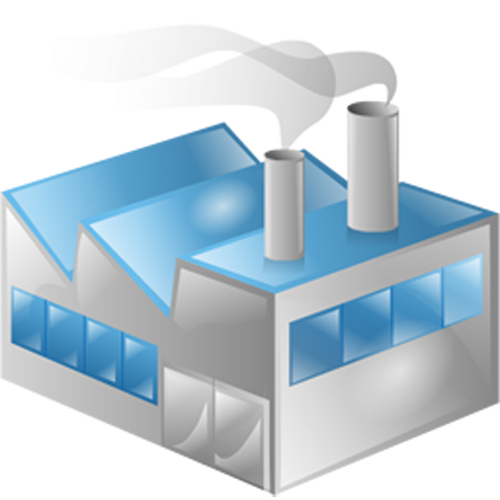 The devices are specifically designed to meet the needs of multi-location organizations. Furthermore, the devices can be connected with a central server at a single location. This resolves the problem of collecting large amount of employee attendance data from multiple locations. The devices allow attendance marking of each employee based on their credentials, such as fingerprint, Face, etc., leaving false attendance marking completely out of the equation. The solutions also offer flexible attendance policies. We strongly suggest Face Recognition Attendance terminal for non white caller category, because Face Reader is designed to work on extreme conditions such as Constructions, Oil & Greece environments. Like all biometrics solutions, face recognition technology measures and matches the unique characteristics for the purposes of identification or authentication. With its high-resolution infrared night vision light and professional color duo camera, the terminal can carry out quick verification in any environment. What is more, it supports face, fingerprint, user ID, password, RFID card (optional) and various combination methods, in order to satisfy the demands of different users. Face scanning biometric tech is incredibly versatile and this is reflected in its wide range of potential applications. Most of the organizations have certain areas or places in their premises where they want control over access of employees. Areas such as the R&D centre, QC department, Server Room, MD Room etc. 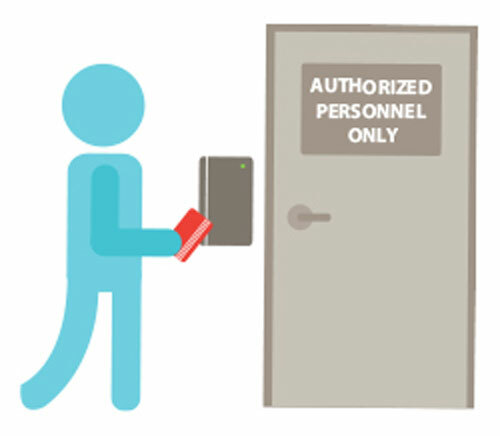 may fall into the category of places where organizations require access control. Besides, organizations want an access control solution that not only provides security but is cost effective. Our recommended products are SBX7 (cannot take attendance), SBK20 (with attendance). We offer access control capabilities either as a standalone solution or with our time and attendance solutions. In this application we provide a biometric / pin code based access control solution that will keep an entrance locked an only open the barrier (Door, turnstile, etc ) upon recognition of the individual via fingerprint, facial recognition or correct pin code entry. 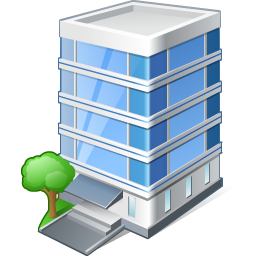 This can also be link to business rules that govern when an employee can and cannot access a particular area of the building. For instance, if the individual should not have access to the office over the weekend, the system will not allow to that person. It will however record the attempt at entry. Our recommended products are SBACF19 w/ F12, SBACIN01 w/F12. 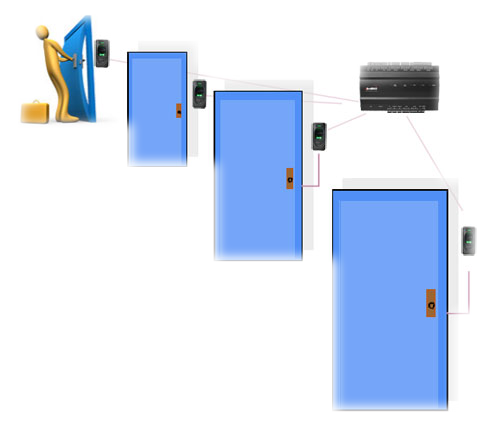 It’s a controller to manage multiple doors from a centralized location. It will support both RFID Card and or Fingerprint for authentication. Real time monitors will help to identify staff in / out status. Web based access control software will allow you to control the door access rights by individual staff, by time & by door. Recommended products are SBINBIO260, SBINBIO460 / C3200, C3400. Biometric door locks marks the advent biometrics into people's everyday life. With biometric door handles available at large, biometrics is now a household thing. Biometric doorknobs are now being increasingly used in villas, condos, offices and even server rooms. With biometric door locks, your fingerprint is the key. 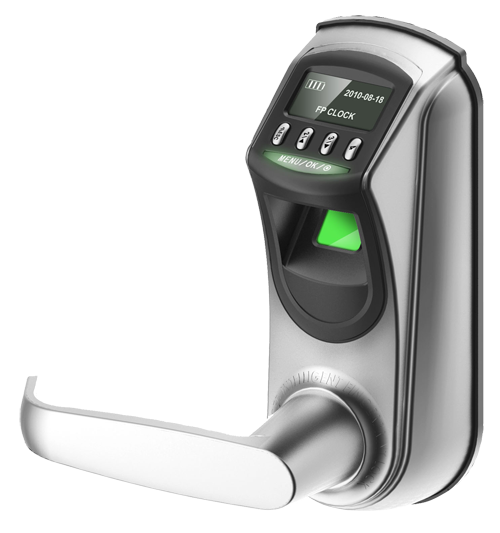 They replace keyed locking mechanisms with a fingerprint sensor that actually recognizes who is and who is not authorized to enter. Biometric door locks gives you the power to secure your home with the latest in technology and at the same time eliminating the headache of shared or lost keys. Now with the fingerprint biometric door locks you can have both security and peace of mind. Biometric door locks guarantees peace of mind by eliminating the need for managing keys. How many times have you lost your keys? How many times have you replaced your lock? We all have been through such conditions, and know the frustration of waiting outside, not able to anything. Fingerprint door locks are very easy to install and can be fitted easily like any other lock. Each lock has a biometric scanner which scans the individual fingerprints. Once registered all users of the lock can easily access the premises whenever they want without any trouble. Fingerprint records can be added and deleted on the fly, so in case you have a shared residence, you can easily add any new fingerprints and even delete the obsolete ones.